Mino (美濃市) is located in the center of Gifu prefecture. It is well known as its Washi paper and Udatsu. The area of Udatsu is called "Udatsu no agaru" Town. 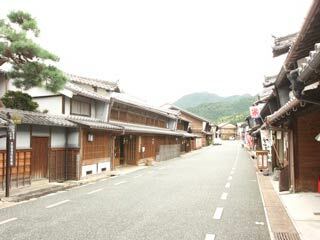 It's a Edo style town with many traditional merchant houses which remains since Edo Period. It offers great walking around Edo period. Those beautiful art of classic architectures are not only amazing but also they are still in use today. Also, Mino is very famous for its Washi. There are many Washi products in this city, and Akari art which is the art of light with Washi paper is one of must see things in Mino. Udatsu no Agaru Machinami (うだつの上がる町並み) is the Edo style town with many traditional houses which remain since Edo period. Because the merchants of Mino was very wealthy, their houses have great "Udatsu." Udatsu is the traditional fire-protection during Edo period. It was also used to represent the symbol of success for the house. Therefore, Udatsu in this area are all great with excellent decorations. With those art of Udatsu, this area of Mino is called "Udatsu ga Agaru" site. Mino Washi Akari Art Museum (美濃和紙あかりアート館) is the museum displays the prizewinning works from Akari Art Exhibition. In October, Mino has Washi art festival called Akari Art Exhibitions. Akari Art literary means the art of light. Because Mino is very famous for its Washi, they have an art exhibition of Washi art. The Akari art is the design of how you can express the light through the Washi paper. Ogura Park (小倉公園) is a ruins of Ogura Castle located in Mino. It was hilltop castle. The top of the mountain is 159m high, and today, there is an observatory where you can enjoy great view of Mino. This park is also popular Sakrua spot in Mino. There are about 1,000 Sakura which bloom in April.